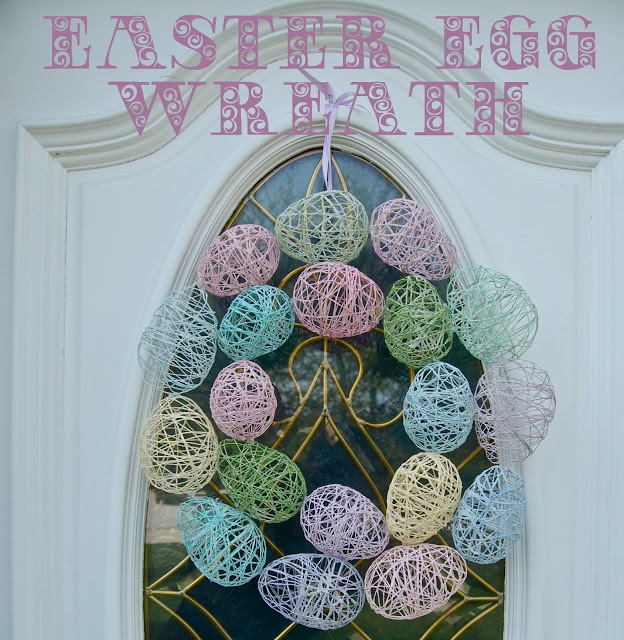 This Easter Egg Wreath is a simple and easy DIY! This Easter Wreath DIY is less than $10 to make, and is so pretty. It is delicate but holds up year after year! 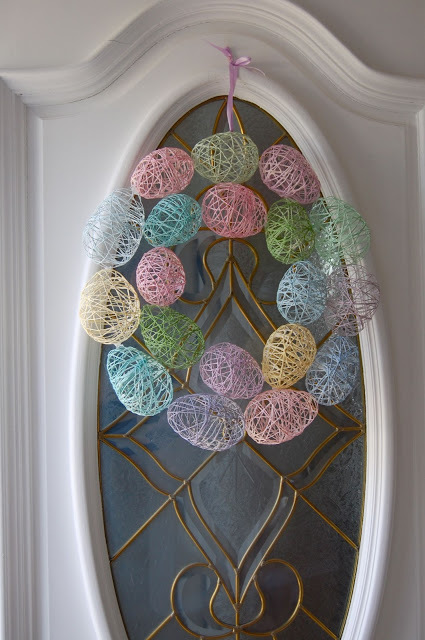 Since seeing this idea way back in like January, I have wanted to use it to make an Easter egg wreath. There are tons of people out there trying their hand at this, but my absolute favorite is found here. 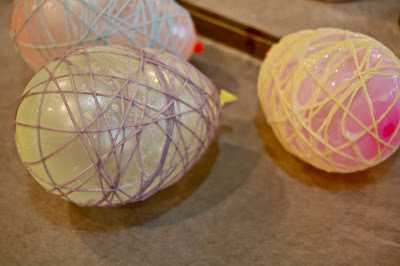 More recently, Alissa, at Crafty Endeavor did this post about making an Easter Egg Garland. Alissa is smart, and she made this project about a million times easier for me. HOW DO YOU MAKE AN EASTER EGG WREATH? 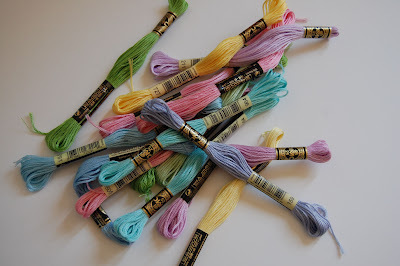 First, you need a lot of embroidery floss, about 20 to 25 skeins, in lovely pastel Eastery colors. Water balloons – they make the perfect shape, but they are very hard to blow up. Some readers have suggested using a pump, which is a great idea. Full sized balloons – they are very easy to blow up, but you have to be careful not to blow them up too much or you will get spheres instead of eggs. Additionally, you need to make sure you tie them very tight or they will leak and deflate before your string dries. Carefully put one skein of embroidery floss into the starchy mixture by unraveling it into the mixture in nice loops (pictured above). Resist the urge to just throw it in, or it will become a gloppy mess. Working over wax pepper, begin to wrap the floss around one balloon, using your fingers to pull off excess liquid as you go. Make it go through two tightly pinched fingers before it makes its way on to the balloon. One skein will go perfectly around one balloon. 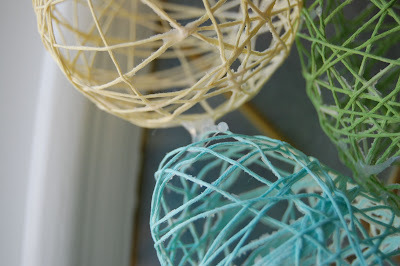 Place the wrapped balloon on a piece of wax paper and allow to dry over night. In the morning, flip all the eggs over and let them finish drying for a few hours. 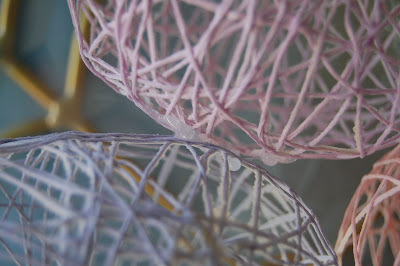 Once the embroidery floss is completely dry, pop the balloons. (Note: It helps to push the balloon away from the dried floss a little before popping.) Carefully remove the balloons from the inside of the egg and use a needle or toothpick to work away any excess dried starchy liquid. 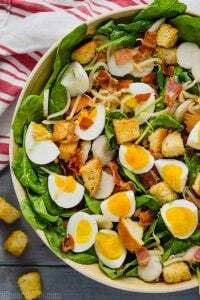 Finally, set a bowl on wax paper and use it as a guiding shape to form to circles around with the eggs, hot gluing them together as you go. It helps to form the wreath completely, arrange the colors how you want them, and then remove one egg at a time to glue it in. And here it is hanging up. So if you’re keeping track, I did it for under $10. Not bad for a fancy looking wreath. I love how you turned the eggs into a wreath, it looks great! This is so incredibly wonderful! I have seen this technique before, but never with water balloons as Easter eggs. I am now becoming a follower. I can’t wait to see what you come up with next! This is so pretty!! I will be emailing you for sure come sleep training time! Love this idea-might need different stuff in the Uk to starch it- do you think white glue might work ? I just love it. Looking for the balloons I know I have in my craft cave and then I can start to make the wreath! I’m not sure if it can be done with glue or not . . . I think it is definitely worth a try. If that doesn’t work, do you have anything else in the laundry section that is used for starching clothes? I am going to try Elaines Tacky glue or Elmers with a little water. Have used these products with similar crafts with good results. That is the way I did it years ago. Works great. I did the large balloon and after it dried I cut an oval opening in the front and filled it with grass, bunnies etc.etc. In this case you have to make sure the bottom is flat. Can still decorate it at the opening with flowers etc. I did try it with glue. I used a heavy twine and it did not work. The whole thing just fell apart. Not sure if i was the glue or the heavy string. I was making Christmas balls with glitter on them. when i popped the balloon the ball collapsed into itself. It was a watered down white glue. You can use glue I just used a sponge and dab on the balloon then wrapped around the string it also dries quickly. Has anyone tried this using a white glue & water solution? I use this to “starch” crocheted snow flakes. May not be as messy as the flower. Just a thought. I’m going to give it a try. Love the wreath! Let us know how it works!! So pretty, can’t wait to give it a try. Was wanting something “springy” looking and your daughter is beautiful! Too cute!!! Suggestion for the hot gluing issue. Purchase one of those $1 table clothes from the dollar store and use it when hot gluing. Inexpensive, multiple uses, can be folded/unfolded to cover a variety of coverage areas. Wait. The carpet isn’t the best place to do crafting that involves hot glue?? 🙂 Yeah . . . not one of my smartest moments. The table cloth is a great idea! Thanks for the suggestion!! Wal-Mart sells it back in an aisle with laundry softeners. Be sure to get the refill bottle. It’s actually cheaper per ounce and you may find other crafty ideas you can use it for. 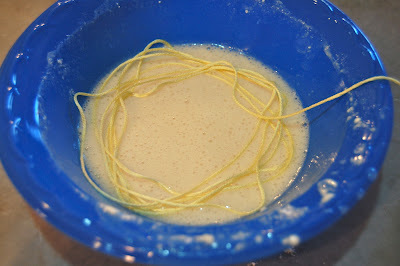 You can make liquid starch using corn starch and water. just google it. LOVE THIS. How about a sugar and water mixture. Thats what i use on my snowflakes. I don’t think that would work because of the balloon, though I certainly could be wrong. If you try it and it works, let me know! We always used sugar water. How much sugar and water per container. I tried that a few years back. It worked great. I just can’t remember the quantity of each. Hi Becky! I’m a little confused. I didn’t use water or sugar to make this . . .
Love this idea. Do you think it’ll last outside during rainy days? Unfortunately, I don’t :/ I think that if it were in the open, but covered by a porch over-hang, it would be okay. But I don’t think it would survive a lot of direct contact with weather. I think the sun will heat up the hot glue and it will fall apart. Might want to us string to tie them together after glueing it. I made a flipflop wreathe one and the hot glue melted in the sun and my flipflops were on the ground. I disagree Kandace. Our wreath was hung in direct sun and did fine. I used my yoga ball pump to blow up the balloons. It made blowing up the balloons super easy, so the hardest part was tying off the teeny balloons. I found the water baloons at Walmart inside a can that was also a pump. It is called X-shot. Worked perfectly! Fill the balloons with water first, makes blowing them up a breeze. Mine were super easy to tie… maybe because I took her advice and spent more than 50cents on the pack. What a cute project! 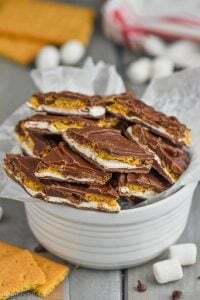 I love it so much that I decided to feature it in our roundup of Easter crafts! 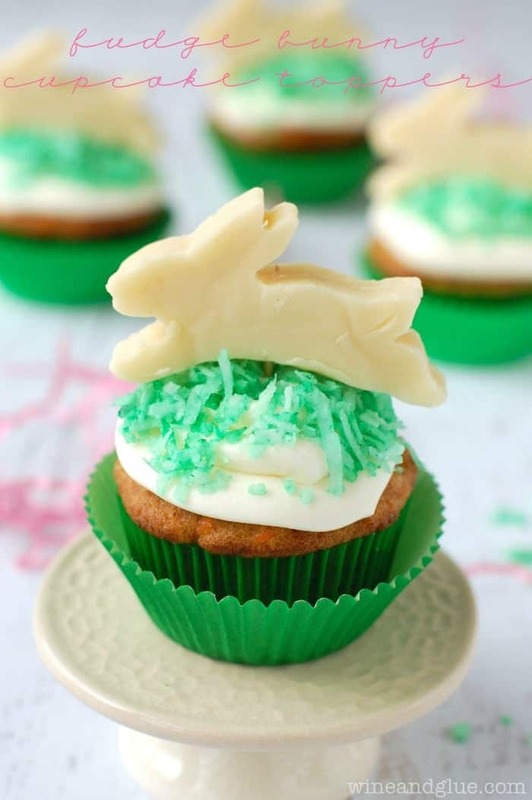 Check it out here: http://kraftycardsetc.blogspot.com/2013/03/15-last-minute-easter-ideas.html. What a cute wreath!! I will definitely be trying this for my mantel! Tracy @ The UnCoordinated Mommy recently posted…Do Parenting Books and Magazines Really Help? If you try them on a wire rack with paper under it to catch drips it will help with drying. i am think twine and elmer’s with cake coloring would be cheaper…. I just made this Egg Wreath and it turned out beautiful, I just love it. Thanks for the idea, very Eastery!!!!! Blowing up my balloons was pretty easy just stretch them a few times and blow them up! I will probably be making another one to give to my Mom. OMG! This is too cute! Im from Brazil, and just saw this project! Congrats for the work and ideas! A couple of weeks ago I saw a wreath similar to yours in a magazine when I was at the drs. office. It used STIFFY for glue and it was just one row with a big bow. I couldn’t find the magazine so started to search the web and came across yours. Where did you get this idea? I am in the process of making the wreath but I would love to know magazine I saw it in and wondered if that is where you saw it. Very cute! Linda, I never saw the magazine 🙂 This post is actually from two years ago, and just came from the depths of my brain 🙂 I got help making the eggs from the blog I reference in the post. I tried using white glue but it didn’t work. The starch+flour method didn’t work too. Any ideas what went wrong? I can’t speak to the white glue method, but the starch and flour method worked like a charm for me. What kind of starch did you buy? Also, I’m guessing you did this, but just to be sure, was the thread 100% dry when you popped the balloons. Mine took forever to dry, and I had to rotate them. 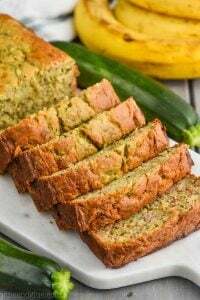 Do I need to heat starch when adding flour. Tips on mixing plz?. Jessie, this was one of the sweetest comments I’ve gotten in a long time. It totally made my day. Thank you! Great job.. looks like this mommas surgery recovery will be spent making all kinds of things..
Hi Carol! I can’t speak to how yarn would work since I’ve only used the embroidery thread. I would suspect that yarn would work, but I would really make sure that you use your fingers to wipe off any excess liquid, and it will probably need more drying time. This is going to be my Saturday project this weekend. I love it! I couldnt blow those things up for the life of me! I used an air compressor carefully! It worked perfectly! I’m so glad it wasn’t just me Rhonda! Hmmmm, I’m not really sure what you mean Amber . . . I just kind of went all over, no rhyme or reason. So I am a couple years behind on finding this, but I LOVE this wreath idea. My husband and I are in our first house and it’s become my mission to make cute wreaths for all the different holidays…and I just found Easter! 🙂 Quick question, how fragile is this? I want to make a wreath I can use over and over again and I wasn’t sure if this would be too fragile. Thoughts? Mine has held up really well, and it’s been three years! I would say just make sure that you store it by itself in a sturdy container. I am currently working on these know!! It is very fun and creative. I am using Elmer’s glue, is that ok? Elizabeth, that’s not how I made mine, so I can’t really speak to how it will work. I hope it turns out for you! Anna, I know that some people have had trouble with this, but honestly mine worked fine. I think that the biggest thing is to make sure that the string is absolutely dry. You need to flip the eggs at some point in the process so that the bottom can dry too. This is the problem I had-they weren’t even egg shaped when I blew them up-had like 2 or 3 out of almost 30! I had water balloons and pd $1.60 for 100 I believe it said. They are cute-extremely messy-was so glad I wore disposable gloves!! ha! Not sure what you mean by add your url-if you mean where I am reading or if I have one-which I don’t 🙂 Added the site I am on. Hi Jo! I’m sorry these didn’t totally work out the way you wanted them to. I’m sure it’s different balloon to balloon. When I remade this this year I used normal sized balloons and just didn’t blow them up all the way. i can not find St-flo at my local JoAnns or Michaels. :(. Hi Pat! I actually bought mine at my grocery store with the laundry supplies! I absolutely love this me, my son, and niece are going to make one of these to hang on the door. What a great idea!! My wreath turned out beautiful but I hung it on the outside of my door & it started to sag due to the humidity, luckily only one egg got destroyed, I was able to fix it. I will keep the wreath inside & store it somewhere cool. i can’t find Sta-Flo can i use Elmer’s glue instead of flour and Sta-Flo? Andrea, did you try near the laundry detergent? I can’t speak to how glue would work as I didn’t try that. Sorry I can’t be more help! Anyone tried using mod podge? I’ve used modge pod for several projects and it worked fine but like she said you have to run through fingers to get excess off and plenty of time to completely dry before using. 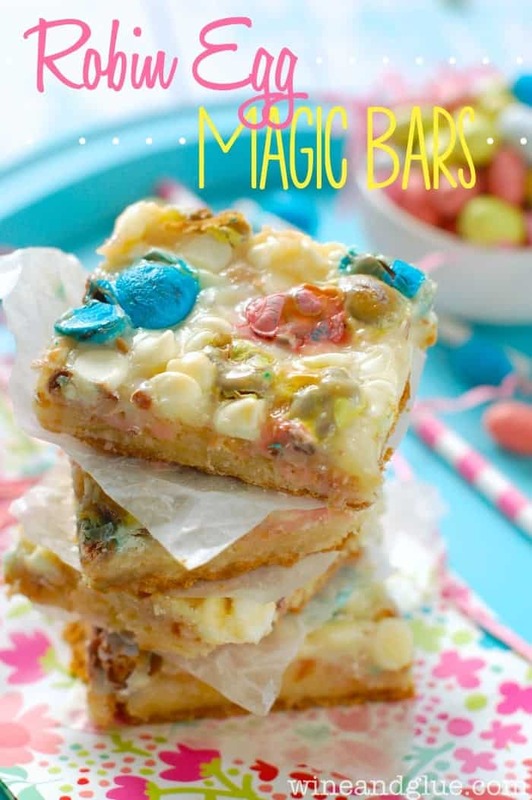 Going to make this and then do as a project for the girls at school, they will love it! Just thinking that when you get it all wrapped, leave a long piece of thread and then you could just hang them to dry, eliminating having to keep turning them and maybe dry easier??? Ooo, possibly Terri! For me it was easier to just flip them then find a place in my house to hang them. But if you have some place easy to do it that would definitely make the drying easier! I love your Easter egg wreath, making my list and buying everything to make me one snd one for my daughter.I think she will love it on her door as well.Thank you for sharing. You can use a simple syrup instead of glue or Staflo. Wrap the floss and paint it with a brush. I used to make Easter baskets for friends with that solution. You can use liquid starch too, it works great. Put the cornstarch in the sauce pan and first whisk in about ¼ cup of the water to make an even slurry, then whisk in the remaining water. Refrigerate the starch when not in use to prevent spoilage. Well . . . not impossible. I did it. Do you use the cotton or satin embroidery thread? I used embroidery thread, though I know that people have done it with yarn. I’m not sure it makes a difference. By looking at the photo of the thread she used it looks like the cotton thread. I am an avid cross stitcher and this is the thread I use…..it is also called embrodiery floss ? I’m curious… Why water balloons instead of regular balloons that maybe aren’t blown up the whole way so they’re small? My momma and I made these!!! Turned out adorable!!!! A little helpful TIP: after we popped the balloon and took it out we got a tooth brush and rubbed off all the extra dried starch around the egg, and it also brings back the color of the string and makes it brighter again!!!!! Oooo, that’s a GREAT tip! Thank you Ashley! Is this mixture of the starch and flower good for more than one day? I’m having trouble getting the string out of the mixture it wants to knot up I’m doing it like you said to do but I take a paintbrush and have to push it down in the mixture, is it too thick? I’ll only have one hand that works could that be the problem…. Can you give me any pointers or suggestions please? Hi Robin! I’m sorry you’re struggling with it! I used it the first day, but I can’t think of a reason why it wouldn’t be fine the next day. It’s definitely a messy project, so you will probably need to get your hands in there to gently push the string down and then pull it out and pull the excess liquid off. I made eggs much like this many years ago. I used white glue instead of starch and flour. I used the eggs to fill baskets to use as centrepieces for Easter. Still have a few of them of them left. I just tried this project with my 5 year old, 4 year old and 3 1/2 year old. Note, the 4 year old is mine, I take care of the other two during the day! 🙂 Anyways the girls loved making them, even though they look weird, but it’s the process not the product that matters when little ones are doing crafty things. 🙂 Also I just discovered your blog and read your “about me” page and you sound like such an amazing fun mom. Looking forward to reading your blog and following you on pinterest! Lisa…I just made the eggs for the Easter egg wreath, but didn’t read the part where you must use water ballons. I used regular small ballons and now I have really big eggs and am trying to make a decent size wreath with them. Where can I find water ballons? I made 20 eggs so now since they are quite large, I have enough eggs for two wreaths. 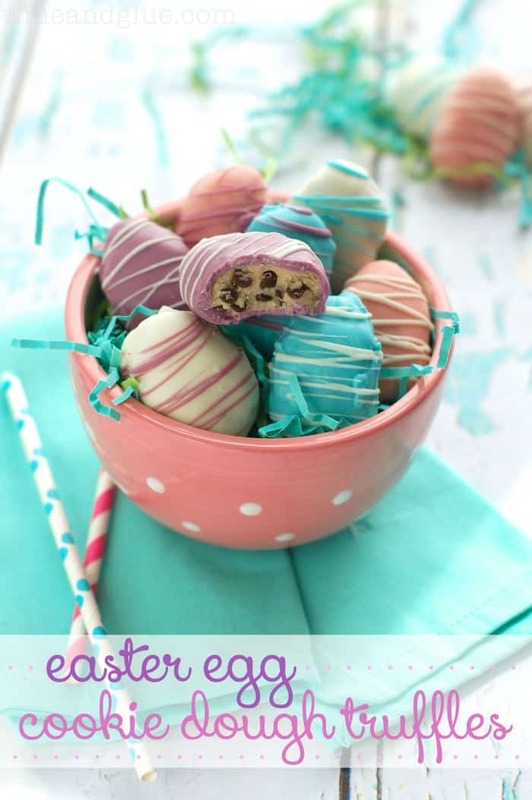 i made them with 1 skein for each egg and they fell apart. when i used 2 skeins they held together nicely and were not so delicate. I also used watered down glue to make them a little stronger than starch. Just wondering if ou could tell me the approx. size of your finished eggs. I bought water balloons ( not .50 ones ?) and when I blow them up they seem really big to me. The ones I got were from Walmart in the party section and were .97. I love the wreath! 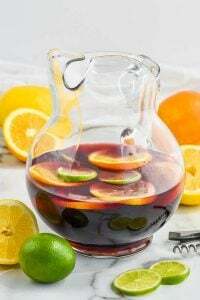 absolutely great 🙂 one thing that called my attention, is when you mention to remove the excess of liquid with your fingers. I made a yarn ball lamp myself, and I found a method on internet, that was foolproof. It was for me, Amanda! Good luck! Does anyone know if this project is waterproof and if not…what can I use On It to protect it? I definitely do not think I would call it water proof. I’m not sure what you could use to protect it. I personally would only use it on a front door that has an over hang so that it wouldn’t get soaked in a storm. I wonder why people don’t read all the previous comments before replying. I feel compassion for you and your frustration as you repeat the same information over and over, and your responses are always gracious and appreciative. I enjoy reading the others’ comments and usually learn from them. Thank you for this great, timely craft which (I plan to do w/6, 7, &9yrs. old granddaughter& her 2 friends this weekend. Oh, Jojo. Thank you. This was full of so much kindness (and you might notice if you read comments on blogs, that that’s not the norm). You made my day.